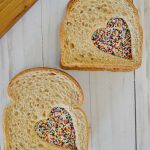 A yummy peanut butter sandwich, with a sweet surprise, is the perfect way to add a little bit of fun into your child's packed lunch. Peanut butter **Also works great with cream cheese or Nutella! If making night before, place in sandwich bag and refrigerate.